Clusters 2.0 participated in TRA 2018, the biggest transport research conference in Europe. 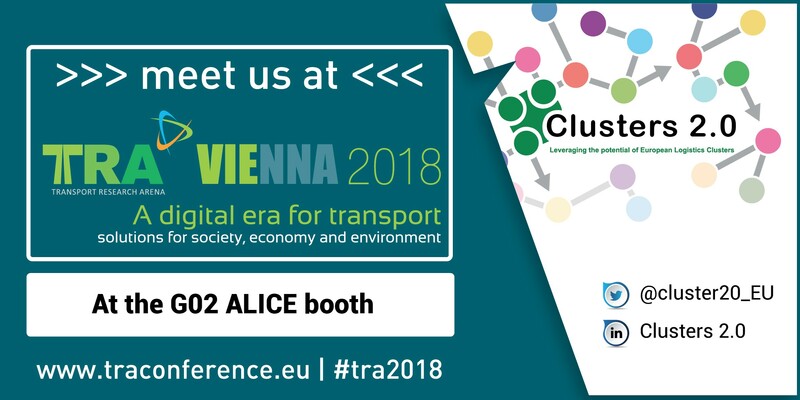 H2020 Clusters 2.0 project was presented during the Transport Research Arena 2018 (TRA) Conference at Vienna, Austria. The conference was attended by European industry representatives from all major transport sectors. TRA 2018 was hosted and organized by the Federal Ministry for Transport, Innovation and Technology as chair of the Management Committee, together with the Austrian Institute for Technology as chair of the Programme Committee and AustriaTech as chair of the Organising Committee. The conference has been co-organised by the European Commission and supported by CEDR and the European Technology Platforms ERTRAC, ERRAC, WATERBORNE and ALICE, ETRA, ECTP, and ACARE. In the keynote, Mr. Gerd Leonhard, Author and CEO of The Futures Agency, talked at the opening session about the importance of new technologies and the role of humans in the digital world of mobility. This futurist catalogued by Wired Magazine as one of the 100 most influential people in Europe (2015), has presented at more than 1700 events in 60+ countries since 2004 to Google, Sony, WWF, Siemens and many others. “To meet the future transport needs of urban centers, we need to organize the transport of people and goods more intelligently, efficiently and sustainably, networking, robotization and artificial intelligence can contribute significantly.” “To meet the future transportation needs of urban centers, we need to organize the transport of people and goods more smartly, efficiently and sustainably. Networking, robotization and artificial intelligence can all contribute significantly.”, Mr. Leonhard mentioned. 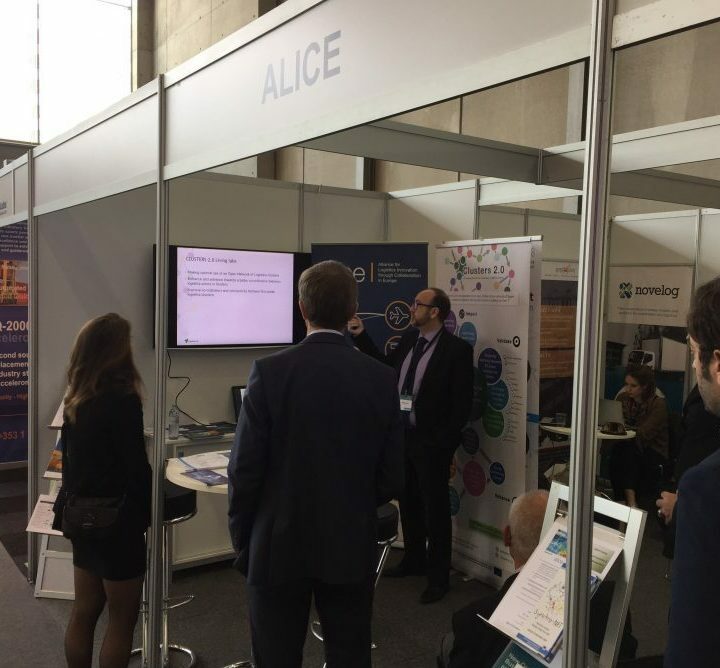 CLUSTERS 2.0 (H2020 project, funded by the EC – more information at http://www.clusters20.eu/) was presented at the ALICE booth with a successful result. Clusters 2.0 will leverage the full potential of European logistics clusters for a sustainable, efficient and fully integrated transport system. The project is running within the period from May 2017 to April 2020. Clusters 2.0 is aligned with the Physical Internet deployment roadmap defined by ALICE, the alliance for logistics innovation through collaboration in Europe, European Technology Platform. Innovative Cluster Handling Technology: Developing intermodal connections with New Modular Logistics Units (NMLU) prototypes, new transhipment and handling technologies. Symbiotic Network of Logistics Clusters: connecting TEN-T corridors’ hubs with other hubs together. As well as a Dynamic Terminal Management Platform. Proximity Terminal Network & Cluster Community System: validating the outputs as Cluster building blocks and the establishment of value added services. To advance in CargoStream, a shippers’ driven Data Collaboration Platform. To implement a Cluster Community System among co-operating cluster partners. To develop a NMLU towards a standard for transport shipment. To enhance collaboration of logistics companies. To increase freight managed in logistics clusters resulting in an increase in load factors and enhanced use of intermodal transport. Mid and long-term effects can be stimulated leading to less CO2 emitted from the transport logistics sector as well as to. During the TRA2018, more than 3,000 experts discussed new mobility solutions for society, economy and the environment. The Clusters 2.0 participation at ALICE stand included a project poster and a video to presented our activities. Finally, a brochure regarding the Clusters 2.0 project and specially designed for the TRA Conference was available at several spots of the event. Also, we distributed the Newsletter #1 of the project that included an interview with Marcel Huschebeck, coordinator of the Clusters 2.0, from PTV Group. On Wednesday, May 18, 2018, there was the presentation of one of the themes highlighted in TRA2018: “Decarbonization and future growth: how to change our mobility system and remain competitive”. During the session, Dr Gerd Schuster, senior vice president, BMW Group, mentioned that “Below two degrees centigrade: that is what the Paris climate agreement of 2015 agreed to mitigate global warming.” In addition, it was discussed how the decarbonization of the transportation system helps achieve this goal. The speaker presented a paradigm shift that allows innovative solutions related to increased traffic demand, individual and social needs and economic competitiveness. Clusters 2.0 goes from this in shaping the new panorama of mobility, this is to present a vision for transport and mobility to Europe. If we want to reach the EU objective on modal shift for all transportation beyond 300 km and attract and competitiveness of local industries at the same time, we need to drive the development of an open collaborative network of hyper connected logistics multimodal clusters building on Ten –T.